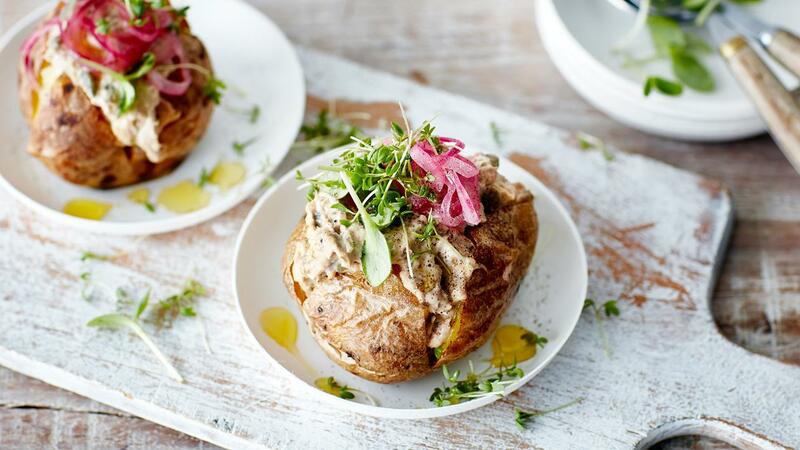 Crispy roasted whole potato with a creamy tuna salad and fresh pickled onions- a twist on an English Pub classic. Wash the potatoes with cold water and dry them. Use some olive oil to coat the potatoes and cook them in the oven on 180C for one hour. Put the tuna from the can in a sieve. Chop the capers and anchovies. Mix the tuna with the Hellmann’s Real Mayonnaise, capers, anchovies and season with black pepper and fresh lime juice. Slice the red onion in very thin rings and put them in a vacuum bag together with the rice vinegar. Seal the bag and let it marinate for at least 3 hours. Put the cooked potatoes in the oven on 220C for 10 min. for a crispy skin. Cut a cross on top of the potato, squeeze the sides. Add the tuna salad on top and finish with the pickled onion and some garden cress.